Opening Hours Reception Saturday, January 26, 2019 6:00 - 8:00 pm; a collaboration with Siren Skirts, 2019 Collection Fashion Show. 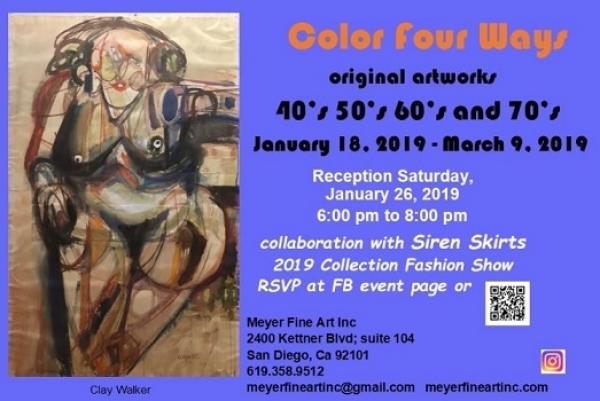 Event Description Meyer Fine Art presents its first exhibition of 2019, a group exhibition from the gallery’s vast inventory of artists. The artwork features original limited-edition etchings, lithographs and other original works on paper by important European, Latin and American artists, some of the most sought-after artists of today. A few original watercolors, acrylic and oil paintings will also enhance the collection. The diverse selection of artists includes Marc Chagall, Joan Miró, Pablo Picasso, Salvatore Dali, Andre Masson, Bolotowsky, Tamayo, Luis Solari and many other notables. Also exhibited will be original paintings by such artists as Howard Koslow and Clay Walker, both artists whose estates the gallery represents. From drypoints, etchings, lithography and serigraphy, this grouping celebrates the art of printmaking, editioned and unique pieces, with work that spans the 1940s – 1970s.